Back in late 2007 I started to see the effect that social media was having on the sales and marketing landscape. While few banks and financial services companies had made the leap into social media, packaged goods companies were jumping in knee-deep. As an entrepreneurial banker I was thrilled by the potential that social media could have on managing reputation, improving marketing effectiveness, and increasing sales. 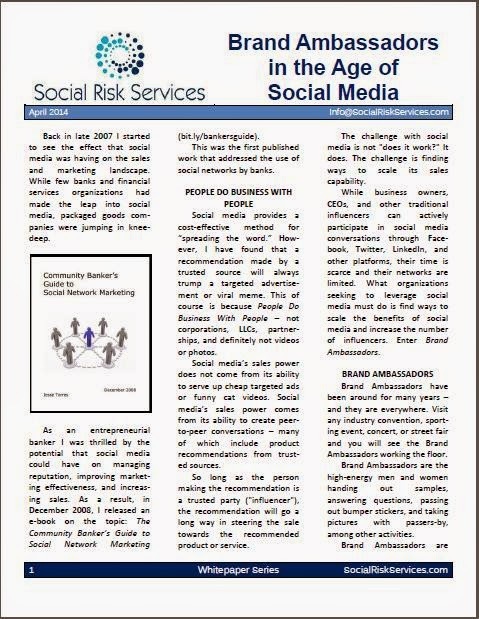 As a result, in January 2008, I released an e-book on the topic – “The Community Banker’s Guide to Social Network Marketing.” This was the first published work that addressed the use of social networks by banks. Social media provides a cost-effective method for “spreading the word.” However, I have found that a recommendation made by a trusted source will always trump a targeted advertisement or viral meme. This of course is because People Do Business With People – not corporations, LLCs, partnerships, and definitely not videos or photos. Social media’s sales power does not come from its ability to serve up cheap targeted ads or funny cat videos. Social media’s sales power comes from its ability to create peer-to-peer conversations – many of which include product recommendations from trusted sources, that result in sales. So long as the person making the recommendation is a trusted party ("influencer"), the recommendation will go a long way in steering the sale towards the recommended product or service. The challenge with social media is not "does it work." It does. The challenge is finding ways to scale its sales capability. While business owners, CEOs, and other traditional influencers can actively participate in social media conversations through Facebook, Twitter, LinkedIn, and other platforms, their time is scarce and their networks are limited. What organizations seeking to leverage social media must do is find ways to scale the benefits of social media and increase the number of influencers. Enter Brand Ambassadors. Brand Ambassadors have been around for many years – and they are everywhere. Visit any industry convention, sporting event, concert, or street fair and you will see the Brand Ambassadors working the floor. They are the high-energy men and women handing out samples, answering questions, passing out bumper stickers, and taking pictures with passers-by, among other activities. Brand Ambassadors are everywhere because they work. They take the multi-million dollar corporations and put a human face on them. They are the smile, handshake, helpful answer, and compliment consumers remember when they think of the brand. But the best part about Brand Ambassadors is that they are ordinary people. They are effective because People Do Business With People! Every company has a cadre of Brand Ambassadors ready for deployment. This group of people is called employees! Traditional Brand Ambassadors are required to have knowledge of the company history, its products, its culture, and its values. These are exactly the same things that employees already know – and live – each day. Organizations seeking to scale the benefits of social media must create a framework that treats every employee as a Brand Ambassador. Organizations should invest the necessary time and money to train and unleash their armies of influencers. With institutional knowledge in one hand and social media skills in the other, employees can act as the greatest form of Brand Ambassador. Similar to the old school Brand Ambassadors working a convention floor, today’s social media-enabled Brand Ambassadors also represent the organization to the outside world. Today, social media has enabled Brand Ambassadors to use tools such as social networks, blogs, and other forms of social media to conduct their influencing activities. Instead of relying solely on senior members of the organization to influence the marketplace through press releases, media interviews and other appearances, organizations can empower employees to go out and evangelize on behalf of the organization. Another important consideration is that the general public trusts its peers much more than it does a company CEO or other high-ranking company official. This makes employees much more influential than the high paid CEO. According to Tom Blackett in Brands and Branding (Bloomberg Press, 2009), “when employees are excited by the proposition they will help to sustain it and communicate it to customers, suppliers and others through their enthusiasm and commitment.” Therefore, to the extent that an organization can properly motivate its employees to act as Brand Ambassadors, employees can become an incredibly effective tool for influencing stakeholders. The maintenance of a strong cadre of Brand Ambassadors will result in a stronger brand, improved customer satisfaction, increased revenue, and strong financial results. According to blogger Mike Bailey ("Beyond Engagement: Unleashing the Power of Employee Advocacy"), “on average, when employees share something with their social networks, each one reaches 20 times more people than a typical brand sharing with the same number of followers.” This makes employee Brand Ambassadors not only a good idea, but a profitable idea. An effective social media-enabled Brand Ambassador Program requires a champion at the highest level of the organization. Effective Brand Ambassador programs that rely on the organization’s employees must have the owner, CEO, or some other top ranking individual act as the CBA, or Chief Brand Ambassador. The Chief Brand Ambassador must ensure that the organization gives more than just lip service to the Brand Ambassador Program. The Chief Brand Ambassador must invest appropriate resources into the program, expect results from the program, hold people accountable for results, integrate the program into the organization’s overall sales and marketing strategy, and acknowledge the program as vital to the success of the organization. The Chief Brand Ambassador must believe that social media combined with employee ambassadors can create an intangible asset that can produce very tangible results. In order for the social media-enabled Brand Ambassador Program to succeed the organization’s leaders must believe in the power of social media. An organization that treats social media as a fad or a waste of time will have a difficult time convincing employees of its power to influence and will not achieve success. Once the decision is made to commit to a social media-enabled Brand Ambassador Program the organization will need someone to care for and manage the program. The Chief Brand Ambassador must select an individual that has a genuine appreciation for the power of social media. The Director of the Brand Ambassador Program must be well versed in the potential risks and rewards that come with empowering the workforce through social media. A common mistake made by many organizations is to place social media in the hands of low-level employees - or interns! Social media efforts should be managed by experienced personnel with a great deal of institutional knowledge. Since the Director will manage the types of content to be shared, a strong understanding of the organization is critical. Further, due to the potential risks involved the Director should possess a level of maturity, experience, and knowledge to protect the organization from reputational and compliance issues. A Brand Ambassador Program will empower and unleash employees in the social media universe by training, inspiring, and encouraging them to utilize social media to "spread the word." Depending on the organization’s social media strategy, these employees may use personal social media accounts, organizational social media accounts, or both, to conduct their activities. Before unleashing Brand Ambassadors organizations must ensure that employees are well trained, understand their role, and recognize that their actions may have both a positive and negative effect on the organization, and ultimately, the organization’s success. The Director must work with internal stakeholders to develop content that can be easily shared by Brand Ambassadors. Content can take the form of text, photos, video, audio, or another form of communication. The Director must also work with internal stakeholders to share best practices relative to content development and distribution. In addition, the Director must ensure that content is monitored and results are reported to senior management and the board of directors. Brand Ambassador success requires that employees commit to the organization’s code of conduct (e.g., respectful tone, free of profanity, etc.) whenever they interact on a social media platform. Employee Brand Ambassadors must understand that the actions they take on social media platforms may be attributed not only to them, but also the organization. Therefore, whether on or off the clock, employees must be aware of the effect that their interactions on social media platforms can have on the organization. It is the Brand Ambassador Program Director's job to manage these risks to a level commensurate with the organization's risk appetite. In other words, risk should be managed to the point of letting management and staff sleep at night. Blogger Linda Tucci describes in the TotalCIO blog at TechTarget.com (“Social Media Risks That Will Make Your Hair Stand on End”) an embarrassing instance involving an executive at a public relations firm. The seasoned public relations executive was flying to meet with a major client. Upon flying to and arriving at the client’s hometown, the public relations executive tweeted that the client’s hometown was one of those places where he would rather die than have to live in. An employee of the client’s firm read the tweet and passed it on to senior officials at the client firm. To say that the public relations executive had some explaining to do is an understatement. The embarrassment caused to the public relations firm by its executive was further exacerbated by the fact that the public relations executive was meeting with the client to pitch, of all things, social media communications! The public relations executive story noted above is an example of a major concern with social media. As more and more employees use social media for personal reasons, more and more of the employees’ personal conversations will inadvertently spillover into the employees’ professional lives. Consider an employee that posts an inappropriate (from the organization’s point of view) comment on a LinkedIn group. The comment could be directly attributed to the organization based on information contained on the employee’s LinkedIn profile. Or consider an employee that posts an inappropriate photo on Flickr while in a company uniform. The point is that even if the organization restricts employee use of social media at work or even if the organization chooses to not to participate in social media altogether, there is still potential risk arising from the activities of employees while on their own time. These employee activities may create uncomfortable, damaging and even legal liability for the organization. Employees should understand that they are all “Brand Ambassadors” and that being a “Brand Ambassador” means acting and responding in an appropriate manner. Anything less may result in significant damage to the organization. Risk management is an important element of any initiative that involves social media use. Many incorrectly believe that risks associated with social media usage are technology risks that can be addressed through technological solutions. This is not the case. Social media risks are people risks. Organizations may be able to control employee access to social media platforms on the company network. However, organizations have no ability to enforce such restrictions on employee-owned and other devices. 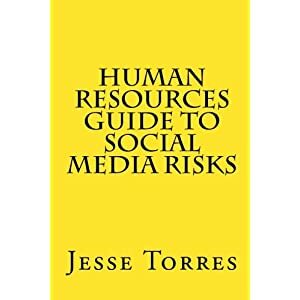 A comprehensive view of these "people risks" can be found in The Human Resources Guide to Social Media Risks. While every organization would like to believe that its employees are smart, capable and masters of common sense, every employee has the potential to “blow it” every now and then. As such, every organization must address employee use of social media through a formal, written social media policy. This requirement applies whether or not employees are communicating on social media in an “official” capacity or on their own time. The social media policy should provide guidance to employees regarding the topics that are open for discussion. Organizations operating in largely unregulated environments can provide simple guidance such as requesting that employees use common sense. Organizations that operate in tightly regulated industries (e.g., securities, banking, healthcare, etc.) should, at a minimum, provide topics that are off-limits due to regulatory restrictions. These topics can include legal matters (potential or current litigation), financial information (e.g., earnings results/expectations, etc. ), and other topics specific to each regulated industry. The complexity and comprehensiveness of the policy should be commensurate with the risks. For example, a small, single location organization where information flows continuously and oversight is abundant may require a less complex policy statement than a company with a geographically diverse workforce. Organizations may include in the social media policy a requirement that states that employees keep the organization’s logo and other protected intellectual property off of the employees’ personal social network pages, blogs, profiles, etc. The organization may also prohibit employees from using the organization’s e-mail address when registering for personal-use social media sites. With respect to employees that maintain personal blogs, the organization should require that employees include a disclaimer that the views expressed on the blog are those of the employee and not of the organization. Social media is built upon the concepts of honesty and transparency. The social media community is not very forgiving when it comes to companies and employees that share information that is intentionally misleading or altogether fraudulent. While inadvertently incorrect information can be forgiven, it is best to have employees interact honestly and with complete information or not at all. In addition to the issues of honesty and transparency is the issue of protocol. Paul Gillin, in his book The New Influencers (Quill Driver Books, 2009), states that the social media community “is developing into an extraordinarily civil and deferential culture.” As such, rude and uncivilized behavior is also not tolerated and can reflect poorly on the organization. While companies should encourage civility, honesty and transparency when interacting on social media platforms, certain information should be off-limits and not disclosed by employees. This information includes confidential company and customer information, information related to legal disputes and other sensitive information. The release of this type of information should be reserved for senior management. Organizations should have an incident response process in place to deal with employee social media content (comments, video, photos, etc.) that create a need for action. Further, the social media policy should enable the organization to demand that employees remove any damaging comments. The policy should state that compliance with this requirement is a condition of employment. Further, employees should understand that noncompliance with the social media policy may result in disciplinary action, up to and including termination. Employees are every organization’s most trusted ally. Through social media, organizations are able to unleash them in a manner that transforms employees into advocates for the organization, evangelizing through their social networks on behalf of the organization. In the 1980’s there was a Faberge Shampoo commercial that spoke of users of the shampoo telling two friends and those friends telling two friends, and so on and so on. Fast forward 20 years. Now imagine an organization’s employees telling their friends, and their friends telling their friends and so on and so on. With proper policies, training, and oversight, the use of employees as Brand Ambassadors can go a long way in maximizing the organization’s brand. If you have questions about managing social media risk in the workplace contact Social Risk Services at Info@SocialRiskServices.com. Social media promotions help to make more brand for business, products and celebrities.Because people uses social media in more times on a day. Some professional companies using the celebrities as brand ambassador for improve the branding of their business.This is the good technique to over take the competitions. Thanks for the valuable informative article. Keep posting and increasing our knowledge with interesting posts. An internship is a temporary position with an emphasis on on-the-job training rather than merely employment, and it can be paid or unpaid. If you want to go into publishing, you might have to take an internship before you are qualified for an actual job. I have done my summer internship reports with the help of to this site Internship Project Reports, which has more than a thousands of topics. Web Click India is one of the best website designing company in India offer complete web related services from designing to development to SEO. Hire us, if you need SEO Services in Delhi at pocket friendly price. Thanks for sharing a very interesting article about Brand Ambassadors in the Age of Social Media. This is very useful information for online blog review readers. Đây là một trong những bài viết hay từ trước đến giờ. Xin cảm ơn bạn đã chia sẻ. Chúc bạn luôn may mắn và thành công! Oh tuhan! Ini artikel yang bagus. Terima kasih sudah berbagi!